Far above the wildfires raging in Washington's forests, a less noticeable consequence of this dry year is taking place in mountain ponds. 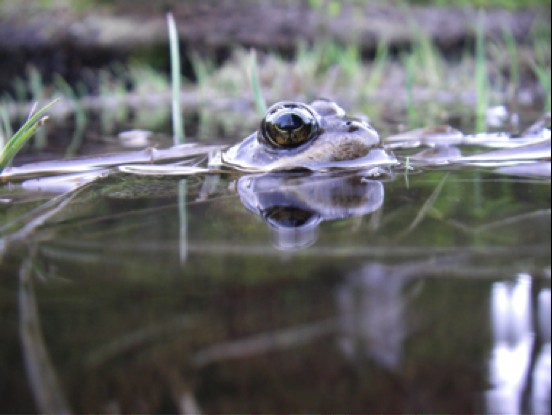 The minimal snowpack and long summer drought that have left the Pacific Northwest lowlands parched also affect the region's amphibians due to loss of mountain pond habitat. According to a new paper published Sept. 2 in the open-access journal PLOS ONE, this summer's severe conditions may be the new normal within just a few decades. "This year is an analog for the 2070s in terms of the conditions of the ponds in response to climate," said Se-Yeun Lee, research scientist at University of Washington's Climate Impacts Group and one of the lead authors of the study. Current conditions provide a preview of how that will play out. "We've seen that the lack of winter snowpack and high summer temperatures have resulted in massive breeding failures and the death of some adult frogs," said co-author Wendy Palen, an associate professor at Canada's Simon Fraser University who has for many years studied mountain amphibians in the Pacific Northwest. "More years like 2015 do not bode well for the frogs." Mountain ponds are oases in the otherwise harsh alpine environment. Brilliant green patches amid the rocks and heather, the ponds are breeding grounds for Cascades frogs, toads, newts and several other salamanders, and watering holes for species ranging from shrews to mountain lions. They are also the cafeterias of the alpine for birds, snakes and mammals that feed on the invertebrates and amphibians that breed in high-altitude ponds. The authors developed a new model that forecasts changes to four different types of these ecosystems: ephemeral, intermediate, perennial and permanent wetlands. Results showed that climate-induced reductions in snowpack, increased evaporation rates, longer summer droughts and other factors will likely lead to the loss or rapid drying of many of these small but ecologically important wetlands. According to the study, more than half of the intermediate wetlands are projected to convert to fast-drying ephemeral wetlands by the year 2080. These most vulnerable ponds are the same ones that now provide the best habitat for frogs and salamanders. At risk are unique species such as the Cascades frog, which is currently being evaluated for listing under the Endangered Species Act. Found only at high elevations in Washington, Oregon and California, Cascades frogs can live for more than 20 years and can survive under tens of feet of snow. During the mating season, just after ponds thaw, the males make chuckling sounds to attract females. "They are the natural jesters of the alpine, incredibly tough but incredibly funny and charismatic," said Maureen Ryan, the other lead author, a former UW postdoctoral researcher who is now a senior scientist with Conservation Science Partners. The team adapted methods developed for forecasting the effects of climate change on mountain streams. Wetlands usually receive little attention since they are smaller and often out of sight. Yet despite their hidden nature, ponds and wetlands are globally important ecosystems that help store water and carbon, filter pollution, convert nutrients and provide food and habitat to a huge range of migratory and resident species. Their sheer numbers—in the tens of thousands across the Pacific Northwest mountain ranges—make them ecologically significant. "It's hard to truly quantify the effects of losing these ponds because they provide so many services and resources to so many species, including us," Ryan said. "Many people have predicted that they are especially vulnerable to climate change. Our study shows that these concerns are warranted." Land managers can use the study's maps to prepare for climate change. 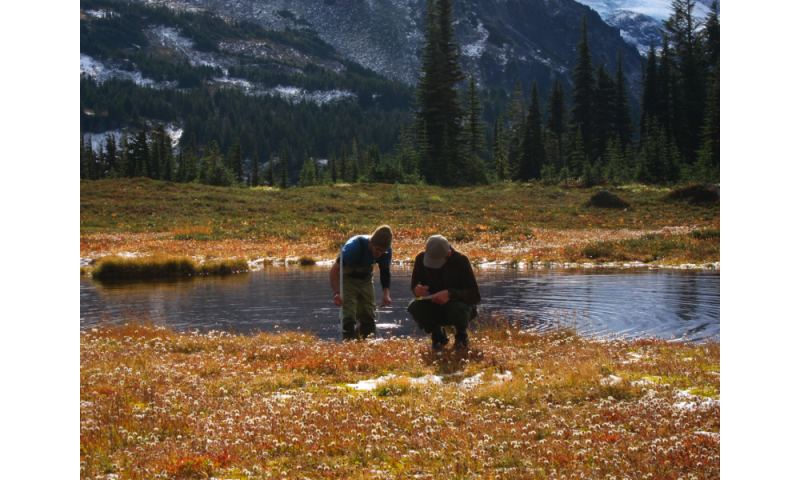 For example, Ryan and co-authors are working with North Cascades National Park, where park biologists are using the wetland projections to evaluate and update priorities for managing introduced fish and restoring natural alpine lake habitat. The new wildlife refuge -- Golf courses? The omission of "ITS YOUR FAULT!!!" not withstanding, the article is a roach. Luckily the paper is accessible, and is actually quite well done. It's been 34 years of climate action failure yet science has never said their CO2 Armageddon was; "PROVEN". What's worse than unstoppable warming? A comet hit? *Occupywallstreet now does not even mention CO2 in its list of demands because of the bank-funded and corporate run carbon trading stock markets ruled by politicians. Who's funding this research? I bet it isn't the scientists who are doing it. And I'd bet it's funded by money taken from people at the end of a gun. Which makes it an immoral act. Please take your political stuff back to FreeRepublic. Please take yours back to mother Jones and mad magazine and romper room. Thanks. You have to outgrow your need for me, otto. I'll pick MAD magazine over the crap you right winger toads read! What would that be? Guns and Ammo? Me? I care about the red spotted salamanders and blue tailed skinks. Seeing them makes life interesting. Not seeing them due to climate change and global warming would be depressing and a real bummer. You right wing nuts need a total and complete reverse brain wash. Your welcome @gkam. Just stating it the way I see it. Thanks to you @gkam for keeping the debate not so stupid. What makes you think I am a right winger toad? Or is that the slogan in your brand new t shirt? Funny how brainless sloganeers are all on the skink hugger side of these debates. This is why the hippy movement is dead - all that's left are you cartoon characters. "What makes you think I am a right winger toad?" I'm not a toad, but I will answer. Because you are completely transparent. Your attitude, your verbiage, aggressiveness, and other failures are neon signs of Fascist maladjustment. Your need for authority glows in your attacks. And your continual references to psychopathy are an obvious cry for help. Ive indicated many obvious examples of your psychopathy. You continue to post new ones every day. As your claims without pproof are worthless (because, well, youre a pathological liar arent you? ), you need to post examples of my 'transparency'. Like I say if you want your claims to be taken seriously youve to include examples. Well @Ghosty, if your not a rightwinger toad, I apologize, If you are I don't. I really meant that for the freepers of wattsupwithyourmama.com that slings their nonsense stuff on issues like this. Basically this article is reporting on something I see more and more. That is creatures that used to be common, the toads, frogs, salamanders, skinks and lizards are becoming rarer and rarer to find or see in nature. Since the global average temp has risen about a noticeable 1C from AGW since I was a kid, you notice these missing creatures of nature. Knowing that is bad, but knowing what mankind's selfishness, deception and greed will bring to the planet in the form of AGW from unregulated pollution creators, is shameful. I really meant that for the freepers of wattsupwithyourmama.com that slings their nonsense stuff on issues like this. .. and not one capital letter in your amusing comment Captain. Thank you, I feel a bit better even if I'm suffering a bad flu. Have one of my lemon slices and a shot of whiskey. thanks for sharing without reading or actually knowing what was going on!